For many it’s hard to imagine Venice has something new to gush over about. We like to imagine the beautiful city in the way we’ve heard it described; San Marco and Rialto, and that’s about it. But there is much more to it as we often reiterate on My Venice Apartment Blog. This time though, the incredible news comes directly from the past and is ready to leave everyone, venetians included, dumbfounded. It’s not a new bridge on the Grand Canal, not a new revolutionary installation, not an extraordinary masterpiece or a new artist ready to reinvent Venice. It is simply a new take on history, a new face to one of the most popular areas on the island: The Rialto area. Whoever has recently visited Venice has surely noticed. Just imagine the dismay when finally reaching the rialto bridge to take a panoramic picture and seeing the bridge itself and the two adjacent historical Palaces as “boxed” up construction sites. For years in fact the most famous Venetian bridge and neighboring Palaces, the Fondaco dei Tedeschi and Palazzo Camerlenghi were undergoing heavy restorations. These days there is the progressive unveiling of the majestic Palazzo dei Camerlenghi (lawyers) that since the 1500’s has dominated the Rialto area, just at the opposite side of the Rialto Bridge facing the Fondaco dei Tedeschi. Headquarters to the Corte dei Conti, this building serves as a perfect “corollario” in the tight ANSA of the Grand Canal that leads to the imminent bridge realized by Da Ponte. 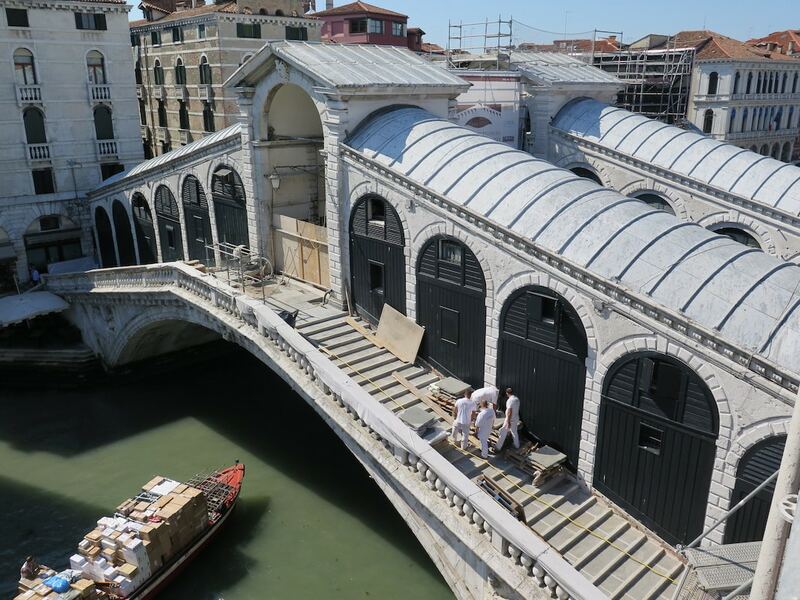 In December, the on going work on the famous Rialto bridge will finally be finished giving the Rialto area a new look, even though it is the same as it has always been. The restoration to conserve this entire zone in fact was meant to polish and clean the white stone that now shines in the sunlight. Always remember the beauty of this portion of Venice is even more appreciated in the moments of lesser tourism (autumn, winter, early morning and night.) Rialto’s new look is definitely a good reason to visit with a new outlook on a new part of Venice.